Health Plan Report Card shows the quality of health care for millions of Californians who get their care through Health Maintenance Organizations (HMOs) and Preferred Provider Organizations (PPOs). 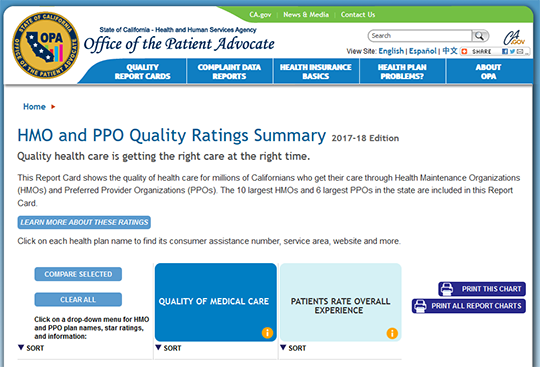 The report cards rate California’s 10 largest HMOs, six largest PPOs and over 200 commercial medical groups on quality and patient experience, and medical group cost ratings. Health plans and medical groups can be searched by county and their scores can be compared side by side. The Report Card provide consumers ratings on patient experience measures related to getting care easily, satisfaction with plan doctors and services, and communication between doctors and patients. The Report Card also offer an assessment of health plans and medical groups who are especially effective in diagnosing and/or treating different health conditions. Consumers can compare health plan performance on various measures.